Recently, about a week ago, i photographed the sunrise at Susan Gilmore Beach. 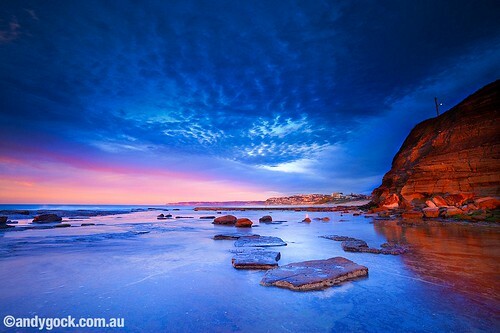 Its a small secluded beach here in Newcastle NSW with great looking rock formations. Ideal for long exposures though you need to get there at low tide. This one below is probably my favourite for the morning. I used a bit of localised channel mixer based colour enhancement here. Keep in mind, i didn’t use it all that much, the sky really was close to that colour when i was there. I used a ND8 filter for this one. This is a single exposure, since i wasn’t shooting into the sun, the dynamic range in the scene was only small (say within 4 to 5 stops), enough to be captured in one shot with a digital camera. The two images below i used a ND400 filter and is also a blended exposure of two shots, one exposure for the sky and one for the foreground (rocks). I learn one thing very important with your blog.Thank you so much! These photos make me feel lucky to live in Newcastle, I want to show my friends! You have captured what I love about this place.